* Please note: This product is only available for shipping to addresses within the lower 48 US states or Canada. Ruth Chou Simons shares her life and her art to help others find the beauty of a grace-filled life. Her unique watercolor style and hand-painted lettering have created a large and loyal Instagram fan base (75,000 followers and growing). Through her art, Ruth shows how God's grace touches us daily. Her Gracelaced collection includes artwork in a variety of styles, sure to enhance your home with beauty and joy. About the artwork: Natural canvas in barnwood look frames, contemporary clean look with a hint of vintage; Gracelaced tag. 18" x 22". Birch trees frame the verdant lettered brushstrokes, Philippians 1:6 Nature theme; focal point decor for the Christian home. 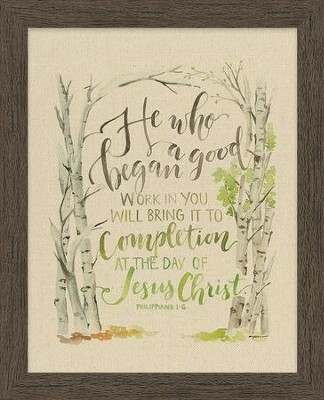 I'm the author/artist and I want to review He Who Began A Good Work in You, Philippians 1:6, Framed Art.